A suspended license can be quite troublesome, especially if you are used to driving around in your car all the time. Whether it comes as a consequence of a misdemeanor or as a result of too many speeding tickets, a license suspension is a common driving penalty. Getting it reinstated, paying all the fees or knowing the difference between a revoked and a suspended license, we have it all covered for you. Who Can Suspend My Driver’s License? The Motor Vehicle Division (MVD). 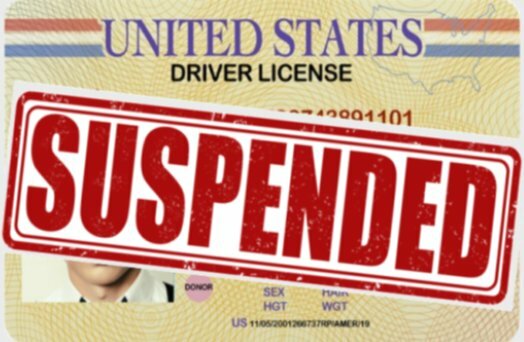 Why Can My Driver’s License Be Suspended? Accumulated points: When you accumulate driving record points, you put yourself at risk of having your license suspended. Make sure you keep those driving record points in check. In Connecticut, for example, you can verify your driver’s license status by checking the CT driving record. Accumulated unpaid traffic tickets: If you are one of those drivers that like to put the pedal to the metal, then you should consider paying your speeding tickets. Otherwise, you might be faced with a driver’s license suspension. DUI or DWI: Driving while under the influence of alcohol or other substances might also lead to a suspended license. Also, if you refuse to have your alcohol blood level measured or checked for intoxication from other substances, you are at risk of license suspension. Reckless driving: Driving your vehicle recklessly may also increase your chances of getting your license suspended. If your reckless driving has more serious consequences, such as harming another driver or other people, you could also be guilty of a felony and might even get arrested. Failure to pay fees or child support. For How Long Can My License Be Suspended? Depending on the reasons for which your license was suspended, you might be faced with anything between a 30 days or a 1 year suspension. Obviously this can differ from state to state so you will have to see how much this costs in your state. Your license could also be suspended for an indefinite period. In this case, the status of your driver’s license will change only after you have followed all the instructions that came with your suspension order. What Is a Suspension Fee and Where Can I Pay For It? If your license was suspended for a definite period of time, you are required by law to pay a suspension termination fee before your license is reinstated. The price of this fee can vary from state to state. In NY you can expect to pay no less than $50. However, depending on the seriousness of the offense that got your license suspended, you can expect to take more money out of your pocket. You can pay this fee at your local DMV office or online. What Happens After My License Is Suspended? After your license has been suspended, you might also be required by law to get registered in a special program such as a traffic school, which is not free of charge. How Do I Reinstate My Driver’s License? Getting your suspended license back will probably be your priority, so here are a few things you need to know about the process of reinstating it. The exact procedure for the reinstatement of your license depends from state to state, so you will have to find out what steps to follow by checking the online legislation of your state. California and Florida may require you visit the CA or FL DMV office and hand in the required documents in case of a DMV suspension, while Texas, Michigan and Ohio offer the possibility of submitting your documents online or via regular mail. Illinois, on the other hand, has a different reinstatement procedure that requires attending a formal or an informal hearing after which the status of your suspended license will be decided. In Oklahoma, you might also have to provide a vehicle liability insurance document from your insurance company. The same goes for Washington, where you also have the option of providing the proof of insurance via a WA State Treasurer deposit. Other DMV offices, such as the one in PA, offer you restoration requirement letters that contain all the information you might need. As long as you have all the required documents for your reinstatement, all should be fine. What Happens If I Am Caught Driving with a Suspended License? Having no driving license can be quite frustrating. However, if you get behind the wheel without the required documents you might have to pay a fine or even do time in jail. While in GA you might get away with a $500 fine, in NJ you could do up to 5 years in jail if you are caught driving without a license. If you are wondering ‘What does it mean to have your license revoked?’ and ‘Is it the same thing as a suspension?’, you should know that the two are quite different. In case of a revocation, your license has been cancelled, which means you cannot have your license reinstated. You need to renew it following the steps of the licensing process required by your state. This means that you will probably have to pass a writing and a road test before you can receive a driver’s license. Even if you are not in a position to drive, you should still consider paying for your car insurance. This can be a little bit more complicated since you cannot register as a driver anymore. However, if there is someone else you are living with that drives your car, you can buy the insurance policy yourself and have the registration made for another driver. Many states, Tennessee included, even recommend pages you should check regarding your insurance, such as TN Car Insurance. These are all the important things you need to consider in case of a suspended driver’s license. You might start considering emigrating to Canada, but before you do that, you should know that Ontario is not that different when it comes to a suspended driver’s license. Hey Buddy!, I found this information for you: "All You Need to Know About a Suspended License". Here is the website link: https://www.duiauthority.com/all-you-need-to-know-about-a-suspended-license/. Thank you.